Questing Ixodes ricinus ticks were collected in two urban parks (Železná studienka and Horský park) of the capital city of Slovakia, Bratislava, during two consecutive years in 2011 and 2012. 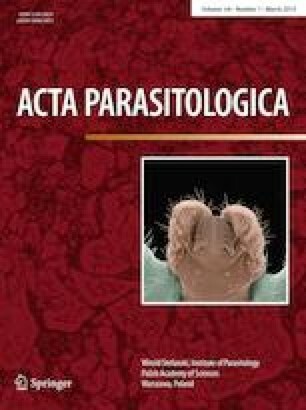 A total of 932 ticks were analyzed for the presence of tick-borne agents: B. miyamotoi, B. burgdorferi s.l., A. phagocytophilum and R. helvetica. PCR analysis confirmed the presence of all pathogens at both localities. The overall infection prevalence of B. miyamotoi, B. burgdorferi s.l., A. phagocytophilum and R. helvetica was 0.75, 13.2, 5.6 and 8.9%, respectively. B. burgdorferi s.l. positive samples were represented by six genospecies. The most frequent one was B. afzelii followed by B. garinii and B. valaisiana. Our study confirms the presence of I. ricinus ticks and at least nine tick-borne bacterial agents in city forest parks, which are used for recreational purposes. Ordination analysis revealed significant differences in the composition of pathogens with respect to study site location, time of season and ambient temperature, despite the fact that both sites are located relatively close to one another within the city. This study was financially supported from the Scientific Grant Agency of Ministry of Education and Slovak Academy of Sciences—mainly by the project VEGA Nos. 2/0119/17 (70%) and partially by VEGA 2/0068/17 and the Slovak Research and Development Agency under contract No. APVV-14-0274, No. APVV-16-0518 and No. APVV-14-0556.